As customary with events that take place in Ontario, the province’s Ministry of Consumer Services has medically suspended the entire UFC 140 roster for precautionary purposes or various injuries sustained during this past Saturday’s festivities. Seven fighters could be riding the pine for up to 60 days, the maximum ban levied for this card, while 16 athletes were banned for two weeks. The show’s most gruesome injury went to Antonio Rodrigo Nogueira. 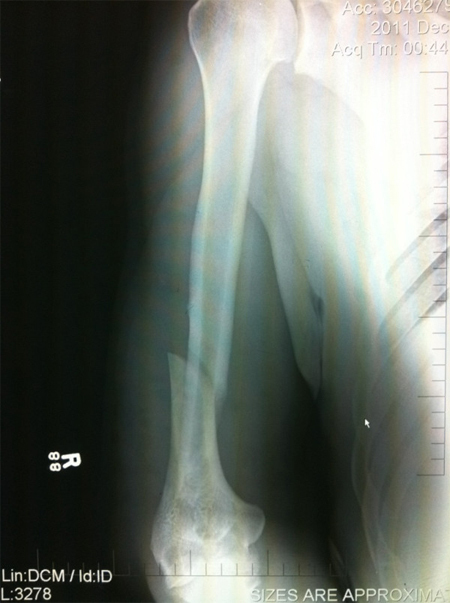 It was initially believed the former heavyweight champ may have sustained a dislocation at the hands of Frank Mir’s vicious kimura, but the X-ray above clearly shows Big Nog broke his right arm. Following a submission defeat to light heavyweight king Jon Jones in the night’s featured attraction, Lyoto Machida was handed a 30-day suspension for the laceration on his forehead. “UFC 140: Jones vs. Machida” took place inside Toronto’s Air Canada Centre.